Forget planking -- who's up for owling? 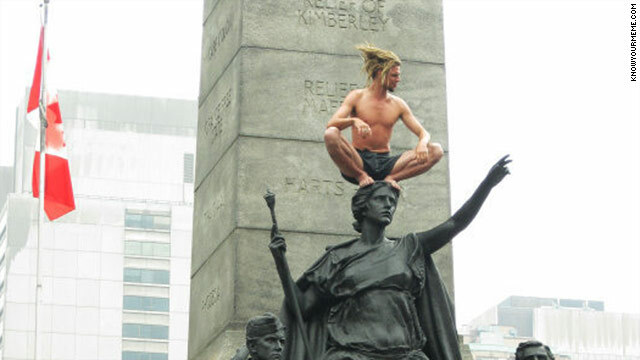 Don't try this at home: Some extreme owling from the Know Your Meme blog. (CNN) -- The sad truth for ridiculous Web memes is that they have remarkably poor shelf lives. So, farewell planking. Deciding that striking a "light as a feather, stiff as a board" pose in public, photographing it and posting it on the Web is old news, some Internet denizens have moved on. Now, it's all about squatting, arms pressed toward the ground and eyes locked in a wise, faraway gaze. You know ... like an owl. If it all seems sort of ludicrous, well, that's kind of the point. "Owling is actually more of an indication of how big planking is," said Ben Huh, founder of the Cheezburger Network of sites and blogs, which focus largely on Internet humor and memes. "Planking is kind of like the Rebecca Black of Internet memes," he said, referring to the "Friday" pop singer. "So many people think it's so stupid -- but they're watching it and they're parodying it." According to the network's Know Your Meme blog, owling was first documented July 11 in a post on Web-sharing site Reddit. It featured a "demotivational"-style poster of a woman "owling" with the text: "Owling: Because Planking Is So Two Months Ago." "Owling is what we call a 'forced meme,' " Huh said. "It's the idea that we're going to try to make something happen in reaction to something else." Actress Hilary Duff became the celebrity world's leading owler on Saturday with this photo on Twitter. Since then, celebrities like Justin Bieber, Katy Perry, Rosario Dawson and basketball stars Dwight Howard and Gilbert Arenas have been among the meme's practitioners. So far, actress Hilary Duff is the world's most famous owler. "Didn't wanna hit carmageddon so I'm just owling all weekend!" she wrote Saturday on Twitter, attaching a photo of herself striking an owl-like pose on her kitchen table. "I think that's the only one so far," Huh said of celebrity owling. "But even the fact that she's part of a forced meme that only got started a couple of weeks ago is pretty crazy." Of course, the Internet is too big for just one weird spinoff from an already bizarre trend. • Coning: The act of buying an ice cream cone at a fast-food drive-through, then grabbing a handful of the ice cream, not the cone, when picking it up. • Toothpicking: Posing on one's head, straight up and down. A sort of vertical answer to planking's horizontal form. • Leisure diving: Posing for a photo in midair while diving into a pool, while attempting to look as casual about the experience as possible. All have one thing in common with owling and planking, Huh said. While they need the Internet to go viral, they are, at their core, old-fashioned sight gags that would have made people laugh decades, or even centuries, ago. "Unlike doing something on the Internet where you just send a photo or meme to your friends, this will get far more curious onlookers going, 'What the hell is going on?' " Huh said. "You're doing it in a public space where everybody is not in on the joke. That's part of the fun."